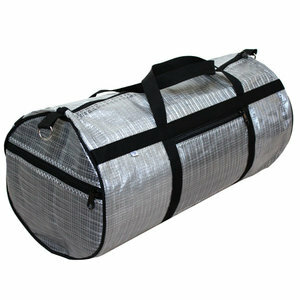 The bag Monsoon is useful in many ways, as weekend bag, beach bag or gym bag. Pack it for the sail race or for a trip to the beach. The cloth is a mesh of white threads covered with a translucent smoke coloured laminate that gives the bag its colour. Sailcloth is water resistant and easy to wipe clean. The bag has a zipper at the top and two zipped compartments on the outside. A shoulder strap with adjustable length is included.